"Why can you never admit it? Why do you always have to be the hard man? Why can you not just say that you miss your mother and you want to be with her before they lay her to rest?" To call Orphans a brilliant dark comedy/drama would be an understatement. Orphans is the story of four siblings in working-class Glasgow, Scotland as they struggle to come to terms with the sudden death of their beloved mother, and the bizarre series of circumstances that occur to them the stormy night before the funeral. Both sweetly touching and wickedly comic, Scottish writer-director Peter Mullan's debut film was awarded Best Film at the 1998 Venice Film Festival. The four Flynn sibs are a wonderfully diverse lot. Middle-aged elder brother Thomas (Gary Lewis) is a stiff, lifeless shell, and seems to live only to please his dead mother. Divorced Michael (Douglas Denshall) is the second eldest, and is a soft-spoken, yet hard-drinking character. Sheila (Rosemary Stevenson), is the wheel-chair bound sister and the youngest is John (Stephan McCole), a hot-headed twenty-something. In an intentionally uncomfortable scene that serves to propel the characters along their respective nightmarish paths, Thomas takes the stage at a boisterous karaoke bar and brings down the crowd with his somber, tearful rendition of Air Supply's "The Air That I Breathe", dedicated to his dead mother. Michael slugs a wisecracking patron, and Orphans then proceeds to barrel along unpredictably as each of the Flynns are driven to the limits of their sanity. 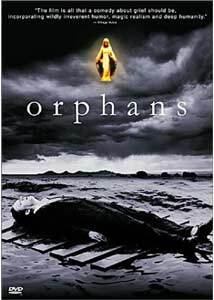 Mullan delivers the goods, both dramatic and comedic, powerfully in Orphans. The dialogue is quick, clever and extremely realistic. The standard issue English subtitles are literally a requirement for this film, as the Scottish slang and accents are thick and fast. Mullan moves characters into sometimes surreal situations with startling ease, and as the twisted plot unfolds it becomes difficult to know whether to laugh or cry as the Flynns begin to crumble under the pressure of their individual grief. In a particularly moving scene early in Orphans, we see the four Flynns at home, gathered at the foot of their mother's now empty bed. Mullan allows us to take in their silent grief, then, as the camera slowly pans across their faces, we are immersed in a shared childhood flashback sequence, featuring their mother tenderly comforting all four youngsters during a violent thunderstorm, as they all huddle beneath her bedcovers. The camera continues to slowly pan, and we are back at the four grieving adult children. Mullan is also able to stage some great comic scenes as well, even though there is a constant undertone of tension and danger. One of the more memorable moments rivals There's Something About Mary in it's use of a particular bodily fluid, and even then Mullan is still able to skillfully evolve that scene into one of dramatic confrontation. Orphans is well-crafted story, and Mullan meshes equal helpings of comedy and tragedy. The story of brothers Michael, Thomas and John really dominate Orphans, but it is a brief scene with Sheila that provides one of the film's visually magic highlights. Having become stranded in her motorized wheelchair on a dark street, bitter and angry Sheila is rescued by a group of young girls, who shower her with the loving attention usually reserved for a stray puppy. In a sequence that plays like something from the mind of David Lynch, the girls push Sheila through a park, singing merrily to themselves as other children frolic happily in the night. Mullan frames the shot beautifully, and it is eerie in it's dreamlike qualities. Despite winning the Venice Film Festival award, Orphans has remained a small foreign film and unfortunately will probably not find a much wider audience stateside. Some viewers may find the accents distracting, while others may find some of the scenes too uncomfortable. However, if you would like to discover a fresh-faced release that never ceases to surprise, then track down Peter Mullan's Orphans. Image Transfer Review: Presented in an anamorphic 1.85:1 transfer, Image has again stepped up with a winner. Flesh tones are consistent, and I noticed little or no bleed. Black levels look good, and the night scenes have great depth, particularly during the candlelit church sequences. Some minor edge enhancement issues, but nothing overtly distracting. This film plays very well on the small screen, and this transfer does nothing to detract. Audio Transfer Review: Image has provided the expected 5.1 and 2.0 English mixes, and neither are noticeably spectacular. This is a dialogue driven film, and at all times the characters are easily heard. Minimal use of any rear channel effects, with the significant exception of the karaoke bar scene. Extras Review: No extras. None. Zip. Zero. Nada. The English subtitles, which cannot be turned off, are a necessity for anyone outside of Scotland, so I can't really review them as an extra. Peter Mullan's award-winning twisted tale of grief and redemption is a winner. It is a dark and somber tragic comedy that is both beautiful and disturbing at the same time. Even with the thick Scottish accents and slang, this is a unique and extremely enjoyable bit of filmmaking.